ZOTAC this week launched its small form-factor (SFF) Mek Mini desktop computer, aimed at gaming in a small volume. 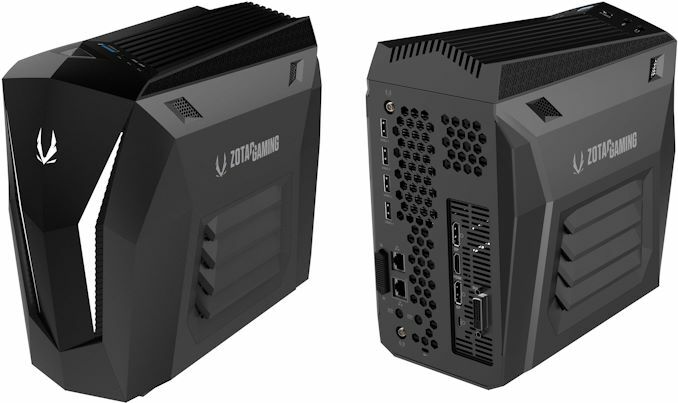 The system will be initially available in only one configuration but is designed to deliver good performance for gamers who prefer compact PCs. Known primarily for its graphics cards, SFF machines, and small form-factor desktop barebones, ZOTAC has been trying to enter the market of retail gaming desktops for several years now. 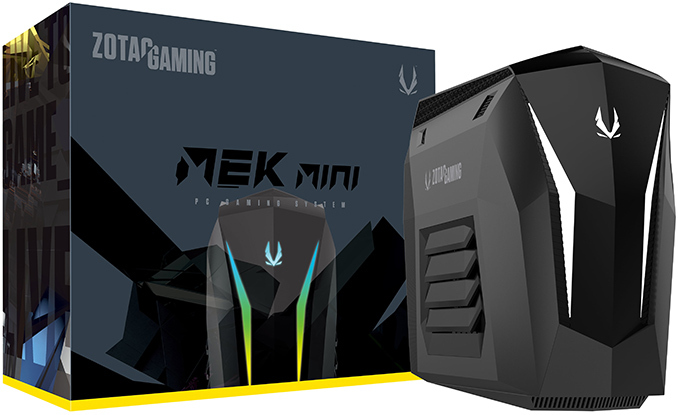 Back in 2017, the company introduced its ‘one-size-fits-all’ Mek1 gaming desktop that combined upgradeability with relatively compact dimensions. The initiative was considered a success, which is why the company rolled-out two gaming PCs in 2018: the Mek Ultra based on Intel’s HEDT platform, and the Mek Mini powered by Intel’s mainstream gaming platform. The former was released back in October, whereas the launch of the latter was delayed for some reason. This week, the company unveiled the final specifications of its Mek Mini that will go on sale in the near future. Measuring 260.8×136×258.8 mm, the ZOTAC Mek Mini is based on six-core Intel’s Core i7-8700 processor accompanied by NVIDIA’s GeForce RTX 2070 graphics card with 8 GB of GDDR5. The system is equipped with 16 GB of DDR4 memory, a 240 GB PCIe/NVMe M.2 SSD, as well as a 2 TB 2.5-inch hard drive. The PC is powered by two 230 W external power bricks. On the connectivity side of things, the Mek Mini has Rivet Networks’ Killer Wireless-AC 1550 802.11ac Wi-Fi + Bluetooth 5.0 controller, two GbE ports (one controlled by the Killer E2500 chip), five USB 3.0 Type-A ports, one USB 3.0 Type-C connectors (one on the GPU), an SD card reader, and 3.5-mm audio jacks. Meanwhile, the ZOTAC Gaming GeForce RTX 2070 has five display outputs (two DisplayPort 1.4, DVI-D, HDMI, USB-C) that can drive up to four monitors simultaneously. Being aimed at gamers, ZOTAC’s Mek Mini has a very sophisticated cooling system to ensure longevity of components, consistent performance under high loads, and quiet operation. It also has addressable Spectra RGB lighting, supporting 13 pre-set lighting modes. Dimensions Height 205 mm | 8.07"
Depth 440 mm | 17.32"
Width 327 mm | 12.87"
ZOTAC will offer two versions of the Mek Mini desktops. 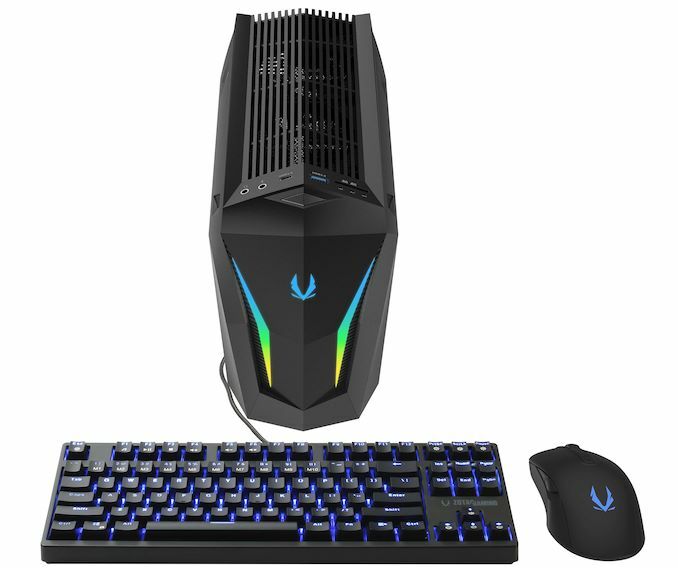 In some regions, the GM2070C700B machines will be shipped with a LED-lit mechanical gaming keyboard and an optical gaming mouse. In other regions the GM2070C701B system will ship without any controllers. In the US the system without the input devices and will cost $1599.99. I think that it needs a few more configuration options so there is broader appeal. At the very least, there should be other network adapter options so buyers can select Intel or Realtek which would certainly help improve its on paper specs and appeal to the gaming crowd. Other GPUs would be nice too like the recently released 1660 variants. The front LEDs look basically non-functional, failing to indicate anything about system status or activity beyond "it's turned on" so dropping them in favor of a couple of small LEDs, one indicating power/standby and another blinking for disk activity, would be a cost savings and visual improvement. Lastly, dual external power supplies make the computer seem like a haphazardly designed system as they're inelegant to say the least. I'd also suggest changing the name as "Mek" strikes me as rather childish. Granted its only a product branding thing, but it is off-putting. I also fail to see any reasonable usage scenarios where I'd want to perform link aggregation (DoubleShot's industry standard terminology) between wireless and wired adapters. In gaming usage scenarios that rely on a WAN connection, it will make no positive difference with respect to network-induced latency given where traffic is flowing and, I'd contend, may introduce problems that would never crop up if a person was using a single adapter (wired or wireless as needed given the physical constraints of the environment). As someone who was a network engineer (now cybersecurity), I'm appalled at how Rivet presents its products. The marketing materials and methods have a predatory, used car salesman taste to say the least which is a twofold problem, I think. Firstly, as you've said, Killer NICs have had a long history of being outstandingly awful products in the past. Even if that isn't the case today and driver quality or the software networking package have improved significantly, that reputation will continue to haunt the company for as long as people that feel cheated are around. Secondly, present day features and sales tactics, including the damage control from its employees like the post above, assume a low level of buyer sophistication. Even Ian has once said in comments in defense of Rivet Networks that readers here will not understand the technology while discussing the lack of benchmarks or technical information published despite the positive coverage a lot of us objected to over the years. That marketing method is primitive to say the least, makes it appear that customers are looked down upon by the company, and implies Rivet Networks exists solely to generate profits off the foolish. That's an ugly cornerstone to say the least. Even if generation of profits as a reason to exist is true and we all know it, maintaining the illusion of mutual respect between customers and companies is vital over the long run so that intermediate hardware integrator businesses like Zotac don't lose sales in a misguided attempt to mark off the "premium gamer networking" checkbox when their designers are coming up with specifications for the next great RGB-cancer-l33t-fragz PC.